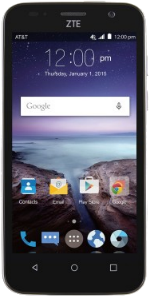 View all the Pure TalkUSA plans that work with the ZTE Maven 3. Compare Pure TalkUSA plans that are compatible with the ZTE Maven 3 using our tool below. The ZTE Maven 3 is a smartphone with a 5-inch FWGA display with 854x480 resolution. From within, the phone runs on a 1.2GHz Quad-Core Qualcomm Snapdragon MSM8916 processor with 1GB of RAM and 8GB onboard memory. There is a microSD card slot for memory expansion of up to 32GB. On the back of the phone is a 5-megapixel camera with 720p video recording quality. In front, a VGA camera is available. The device also includes a 2,100mAh battery for up to 18 hours of talk time and 12 days in standby mode. Upon release, the phone runs Android 5.1 Lollipop OS.